Something sinister seems to be brewing in Suiten town, a remote mountain village on the island of Kyushu, Japan. The spirits are restless and a malevolent ghost is appearing with increasing frequency. An old religious cult is suddenly getting lots of new converts, especially among high ranking politicians. And just what are the scientists at Dai Nippon Bio up to? Can Tarō and his friends find the answers they need in time to save their friends and families? We first started watching Ghost Hound thinking that it would be, you know, about a ghost hound. Well, the title is a little misleading since there are just a few episodes where a spirit hound shows up, and then only briefly. But Ghost Hound is an excellent anime nevertheless. It was written by Shirow Masamune, who’s most famous for the Ghost in the Shell series. Ghost Hound is like a psychological thriller combined with some atmospheric horror, Japanese mysticism, and biotechnology. The jazzy opening theme doesn’t really match the serious mood of this haunting tale, but then again Ghost Hound is one anime that likes to mess with your mind. Ghost Hound covers a lot of heavy concepts, with the workings of the human brain being one of its main focal points. The story overall is pretty dark as it has to do with death, suicide, and other mature themes. 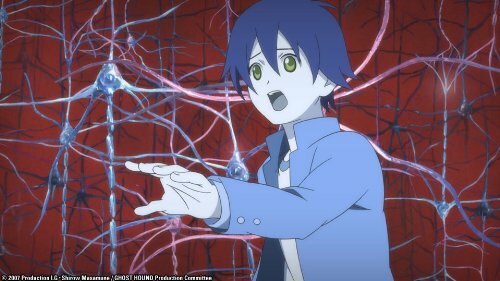 But if you like strange mysteries and conspiracy theories, as well as psychology or neuroscience, you will like this anime. The main character is a 14-year-old boy named Tarō Komori, the son of a sake brewer. Tarō was kidnapped along with his older sister when he was 3 years old, but the kidnapper was run over and killed before the ransom could be delivered. The police eventually found the children in an abandoned hospital, but not before Tarō’s sister died. Tarō still has recurring nightmares about the kidnapping, in dreamlike sequences that are repeated throughout the anime, and he sees a therapist on a regular basis. Tarō’s high school friends, Makoto and Masayuki, also had traumatic experiences when they were children. Together, the teens decide to search for answers and are compelled to face their fears in an effort to get over their troubled pasts. The three main characters (and ultimately a fourth) discover how to have out-of-body experiences by which they can explore the hidden spirit realm, which makes for some very surreal scenes. The local Shinto priest and his daughter Miyako also become involved. Miyako not only has the ability to see spirits but also is sometimes possessed by them. Ghost Hound doesn’t start out as being intensely entertaining, and it’s a little hard to follow at first, but the story is pretty well plotted over its 22 episodes. The first few scenes establish the sense of psychological dread that hangs in the air. After that, each episode introduces new situations that will make you eager to find out what happens next. Through it all, the plot is constantly chipping away at the central mystery of what happened in the past. This anime focuses a lot on character development, with a backstory that slowly unfolds over the course of the series. And I mean, it really unfolds slowly. In the beginning very little progress is made from episode to episode, although after the halfway point it picks up a bit and will keep you on the edge of your seat from one episode to the next with all the twists and turns the plot takes. For a while it seemed to be going in all different directions, but eventually everything came together in the end and you find out the inter-connections between the characters. A lot of the stuff in Ghost Hound sounds like something right out of Psychology 101. Seriously, you might want to have a pen and paper ready for taking notes! They throw in a lot of references to famous psychologists, scientific terms, mental disorders, and the history of psychology as well as some pseudo-psychological babble about the mind and quantum physics. Each episode has a theme that usually revolves around some psychological concept. Not many shows have characters who are global warming skeptics, so Episode 10 of Ghost Hound was especially refreshing. Masayuki, Tarou, and Miyako’s dad were discussing humans and nature. Miyako’s dad mentioned that sometimes spirits will take revenge if abused by humanity. Masayuki says, “oh, like global warming!” and Miyako’s dad launched into a dissertation on how there’s no evidence that global warming is man-made. Ghost Hound has a good balance between science and the occult, between adult and kid characters, and between the main characters and their families as well as a variety of other townspeople. Ghost Hound is intelligently written, and its “soul traveling” sequences are very imaginative. Ghost Hound has some creepy parts, but overall it’s not as spooky or scary as Ghost Hunt. Ghost Hound is definitely a unique anime series, and the ending was actually quite satisfactory even though some things could have been explained a little more. If you’re looking for a “not typical” anime, like Kino’s Journey, or more mature themes, like Death Note, then Ghost Hound is right up your alley.